Mark Dever explains how pastors disciple their people. 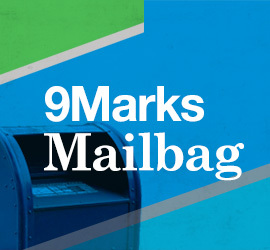 Mailbag #23: Giving Feedback on Bad Sermons; Ratio among Staff and Non-Staff Pastors; Church Covenants and the Regulative Principle; Difference between “Pastors” & “Elders”? — How do you give your pastor feedback for his sermons, particularly when they are bad? — Jonathan, why did you recommend that your church eliminate the requirement that there must be more lay elders than staff elders? — Wait a second! You’re saying you won’t do baby dedications because of the regulative principle. And then right after that, you talk about reading the church covenant together as a church. Isn’t that a violation of the regulative principle, too? — Does it create two tiers of leadership to always call staff pastors “pastors” and lay elders “elders”? Is Your Preaching Tone Deaf? Faithfulness is not just saying the right words. It’s saying them like Scripture says them. In the long run, good, helpful feedback will make him an even better preacher, which will contribute to your own spiritual growth and build up the church to the glory of Christ. Like all Christians, women need the ammunition of the gospel for another week of battle in this hostile world. Why should pastors today read The Art of Prophesying, a nearly 500-year-old book about preaching?